While China and Australia maintain divergent social and political landscapes, sport is a source of common ground – a pastime able to transcend cultural boundaries to form the basis of meaningful people-to-people exchange. After an intensive week of seminars, speeches and sessions on issues ranging from security and the environment to global trade and politics, the final topic for discussion at the 2013 Australia-China Youth Dialogue (ACYD) was that of Australia-China creative industries. Speakers included Leslie Always, Greame Lewsey, Paul Lacy, and Michell Guo. The 2013 Australia-China Youth Dialogue brought together more than thirty young Australian and Chinese leaders from government, business and academia in Canberra and Melbourne to discuss key aspects of the bilateral relationship with leading experts and policy makers. At the conclusion of ACYD 2013, past delegates and supporters attended a reception at the Australian Ambassador to China's residence in Beijing. Delegates from all years had the opportunity to meet each other and exchange ideas, and to say thank you to our supporters. Dr Cai is a Complex Systems Scientist and Economic Modeller with CSIRO Marine and Atmospheric Research. He commenced with CSIRO in 2012 and is collaborating with team members from various disciplines on the integrated assessment of global environmental issues such as climate change, food security, carbon mitigation and energy transformation, and to help society make better informed planning and management decisions. Prior to joining CSIRO, Dr Cai was a Postdoctoral Fellow at the Australian National University (ANU), Canberra, Australia, researching on stochastic economic growth and climate change economics and policy. Dr Cai has been awarded a Bachelor in Economics from Renmin University of China, a Master of Arts in International Finance with University Medal from Korea University, and a Doctor of Philosophy in Economics from ANU. During his PhD, Yiyong was involved in multiple climate policy research projects funded by the Australian Mineral Council, the US Department of Energy, and the Edison Electric Institute. He is also a research associate of the ANU Centre for Applied Macroeconomic Analysis and Asia Fellow of the Seoul-based POSCO T.J. Park Foundation. Timothy Coghlan leads the luxury retail team for Savills Property Services China and advises the world’s most iconic fashion and luxury brands on their China entry, expansion and retail strategies. His clients include, LVMH Group, Kering Group, Richemont, Prada, Dolce & Gabbana, Ralph Lauren, Coach, and Tiffany & Co.
Timothy is also Founder & Editor of Maosuit.com, the leading China-based English language blog dedicated to the business of fashion and luxury in China. Maosuit.com is widely read amongst fashion, luxury and retail industry professionals and averages over 80,000 page views per month. In 2012 Timothy received a grant from the Australia – China Council to create the Australia-China Fashion Alliance (ACFA) project. ACFA utilizes ‘catwalk diplomacy’ to engage the China Fashion Association and China Fashion Week through cultural and business dialogues. ACFA showcases designers, fosters mutual cooperation and collaboration, opens strategic and economic dialogue for regular exchange at the senior government and corporate level and provides strategic guidance to the development of Australian fashion brands, designers and related services in China. Timothy has an extensive global network of fashion and luxury industry CEOs, designers and professionals. He is an influential voice in the China fashion industry and a sought after speaker and media commentator. Timothy graduated from the Australian National University with degrees in both Economics and Asian Studies. He speaks Mandarin and Japanese. Sam works in Sydney as a Solicitor at King & Wood Mallesons in the Mergers and Acquisitions (M&A) practice group, where she has been involved in a wide-range of private and public M&A transactions, for example joint ventures and takeovers. Sam is interested in cross-border M&A and in particular, the legal, regulatory and corporate governance issues affecting China’s outbound transactions. Prior to working in Sydney, Sam was awarded the AustCham China Scholarship which launched her career in Beijing, working as a Graduate Solicitor at King & Wood Mallesons. During her time in Beijing, Sam worked in the Banking and Finance department where she honed her legal and language skills. Sam holds a Juris Doctor from Monash University (2011) and a Bachelor of Arts from the University of Melbourne (2008) with a major in Chinese Studies. As part of her undergraduate degree, Sam spent a semester abroad at Fudan University, Shanghai. From an early age, Sam has been fascinated with China and commenced Mandarin studies in Secondary School. She spent one year in Nanjing (2005) working as a trainee teacher on Caulfield Grammar School’s internationalism program. Sam has travelled extensively throughout China, enabling her to develop an appreciation of the issues and opportunities existing in rural China. Sam is an avid sportswoman and in her earlier life competed at a State and National level in athletics, cross-country and lifesaving. Although her dreams of sporting glory have somewhat faded, when she’s not working, she enjoys running, swimming, soccer and the outdoors. Ed Cousins joined the Australian Army in 2006, and upon graduation from the Royal Military College – Duntroon, was allocated to the 3rd Battalion, Royal Australian Regiment (Parachute) as a Lieutenant. During his time at the Battalion he served in a variety of platoon command appointments. In 2008, Ed deployed as a Rifle Platoon commander to Timor Leste at short notice, following the attempted assassinations of the President and Prime Minister of Timor Leste. The Platoon spent the next eight months conducting Security and Stabilisation Operations in Timor Leste as part of the International Security Force, working closely with the United Nations and Non-Government Organisations (NGO). In 2011, Ed deployed to Afghanistan as a Mentoring Team leader, working to develop elements of the Afghan National Army’s 4th Brigade through the planning and conduct of company level combat operations. During his deployment to Afghanistan, Ed also worked closely with AusAID Stability Advisors and various NGOs liaising with the local population about local development programs. Ed is currently a Captain in the Australian Army and is studying towards a Masters of Security and Strategy though the Australian Defence Force Academy. He is particularly interested in how Australian-Sino relations will develop over the next decade, and feels that greater engagement between the two countries will enhance our economic and security ties. Cameron is an economist who has worked with the Department of the Prime Minister & Cabinet (PM&C), the Reserve Bank of Australia (RBA) and a number of research groups. Cameron has advised on developments in the Chinese economy at both PM&C and the RBA, focusing on the operation of China’s financial, monetary, fiscal, and natural resource management systems. Cameron’s key interest is systems analysis – understanding how different systems, both artificial and natural, interact to produce outcomes that are relevant to individuals and governments. Cameron has a particular interest in natural resource systems. He has previously lectured and tutored in climate change economics and has worked with some of Australia's largest companies to develop and implement greenhouse emissions reduction plans. In 2008 Cameron negotiated one of the largest office building emissions reduction projects of its kind, which was awarded the 2009 Climate Change Leadership Award by the New South Wales Government. He also worked on developing Australia's carbon pricing scheme that has been operating since 1 July 2012. Cameron has a double degree in Economics (hons) and Applied Finance from Macquarie University. He is also currently studying a double degree in Science and Arts at the University of Sydney, which he hopes will further develop his understanding of natural resource systems. Cindy Gottinger is a Brand Management and Strategy specialist at Volkswagen Group China where she supports the development of Skoda’s brand and strategy in a highly competitive and growing Chinese automotive market. Recognised by the company as a young leader in her field, Cindy possesses an appetite to explore new markets and gain deeper insights into the evolving trends of Chinese consumers. Outside of work, Cindy thrives on working with start-ups and frequently advises Chinese and Australian start-ups on cross-cultural marketing and strategic matters. With over ten years involvement in the Australia China community, Cindy continues to be an active participant both in Australia and China. She is currently the Executive Director of Australia China Young Professional Initiative (ACYPI) in Greater China where she successfully established a platform for young professionals to engage in bilateral discussions and exchange. As an experienced presenter fluent in Mandarin, Cantonese and German, Cindy is frequently invited to emcee and moderate a variety of business and community events both in Australia and China. In 2010 she was invited to emcee the AFL first international match played in China between Melbourne Demons and Brisbane Lions where the crowd reached close to 7000 spectators. Before moving to Beijing Cindy worked for AIMG holdings, Australia’s largest Chinese media company, where she managed the expansion of Chinese media properties both domestically and abroad. Prior to working for AIMG holdings Cindy worked in the Private Wealth Management division at Goldman Sachs JB Were. Cindy graduated from Monash University in Australia with a Bachelor of Commerce and Arts majoring in economics, Chinese and German. Isabelle’s interest in China began in her first year of university when she took part in an English Language Tutorial program providing free tutoring to International Students. This interest grew into a passion for student representation and advocacy, which lead to her helping formulate a Language and Cultural Exchange Program as Welfare Officer of the University of Melbourne Student Union in 2012. Currently, Isabelle is the Victorian President of the National Union of Students and is engaged in campaigns for tertiary students’ rights and wellbeing across the state. Isabelle has a particular interest in the welfare of international students, particularly the ongoing fight for equality for international students with concession card travel. She has also advocated for increased International Student representation in student unions throughout Victoria through her work with the Chinese Students and Scholars Association at Melbourne University and Proud to be International Students, an initiative run by the Victorian Branch of the National Union of Students. Anne Kuleshova (BCom (Honours), AIAA, A Fin) is an experienced financial professional, having worked in Mergers and Acquisition (M&A) advisory in a top tier investment bank (Macquarie Capital) and in M&A and Valuations in Deloitte Corporate Finance. She holds an honours degree in commerce majoring in actuarial studies from The University of Melbourne. As an Associate Director 副总监 of China House Consultancy Co., Limited 中皓顾问公司, Anne’s work involves facilitating investment by Chinese State Owned Enterprises, private enterprises and ultra High Net Worths into energy and resources, renewables and agriculture projects in Australia. As part of her role, Anne works with investment banks, company executives, government representatives as well as other professionals to identify investment opportunities for clients. Anne has developed her corporate finance and strategic professional skills through six years’ experience across a broad range of sectors including minerals, resources, renewable energy, infrastructure and funds management. She combines a deep knowledge of financial valuation and analysis with strong experience in mergers & acquisitions and deal execution. Her strong commercial and analytical experience is underpinned by a solid actuarial foundation in mathematics, statistics, risk assessment and economics. These skills are further supported by her highly developed communication, negotiation and interpersonal skills. Anne is very active in charitable, industry leadership and mentoring initiatives and is a member of Finsia’s Young Finance Professionals committee. She speaks fluent Russian and conversational Mandarin. Stephen Minas is an adviser in the Office of the Premier of Victoria, where he has worked on policy areas including international engagement, trade and multicultural affairs. Stephen worked on the development of the Victorian Government’s comprehensive strategy to strengthen engagement with China. Stephen holds Honours degrees in Law and History from the University of Melbourne and a Master of Science in International Relations from the London School of Economics, where he studied on a Graduate Merit Award. Stephen wrote his LSE dissertation on China’s climate change diplomacy and undertook research on related issues at the Shanghai Institutes for International Studies. Stephen’s research on Chinese law and public policy has been published in a number of academic journals. After law school, Stephen studied Chinese for a semester at Fudan University in Shanghai and did some voluntary English teaching with China Study Abroad. As a journalist, Stephen covered the Copenhagen climate change summit, subsequent climate negotiations and other international stories, reporting on-air for RTHK Radio 3 and writing for a variety of publications, such as The Diplomat, China Dialogue and Eco-Business. Stephen previously worked for members of the Australian Parliament on a broad range of policy areas including carbon capture and storage, humanitarian issues and multicultural affairs. Angus holds a BA Chinese (1st Class Honours) with a minor in economics from SOAS, University of London. He has worked for Austrade and China Policy in Beijing. He is currently an analyst at Wigram Capital Advisors, an Asia-Pacific-focused macro-economic advisory. He helped set up and establish the China-Britain Youth Association as their London President. He has had excerpts of his dissertation on the Chongqing Model published in Tea Leaf Nation and the Asia Society’s ChinaFile publication, and has written on the China/US hacking scandal for Silicon Valley’s PandoDaily. He is big fan of 1930s New Sensationalist writer, Mu Shiying, and his twitter handle is @freescania. Alexandra Phelan is a Doctorate of Juridical Science (SJD) candidate and General Sir John Monash Scholar at Georgetown University in Washington D.C, where she works in the area of global health law, with particular focus on Australia, China and US laws relating to health, climate change and pandemics. Before commencing her doctoral studies, Ms Phelan was a solicitor at the top-tier law firm King & Wood Mallesons, where she worked in the climate change law and China groups, and was an active member of the human rights and pro-bono law groups. Ms Phelan holds a Bachelor of Biomedical Science/Bachelor of Laws (Honours) double degree from Monash University, specialising in international law and health human rights, and a Master of Laws, specialising in International Law from the Australian National University. Ms Phelan speaks Mandarin Chinese fluently, holding a Diploma of Languages (Mandarin Chinese), and has lived and worked in Beijing and Dalian, China. In 2012, Ms Phelan lived and worked in Geneva, Switzerland at the World Health Organization as Gender, Equity and Human Rights intern, and as legal consultant at the GAVI Alliance (the Global Alliance for Vaccines and Immunisations). That same year, the Law Institute of Victoria recognised her as a Young High Flyer in law. Sarah Stewart is an MBA candidate at Harvard Business School, passionate about technology, cross-cultural management and the realization of potential. Born and raised on the NSW Central Coast, Sarah’s engagement with China began in 2007, when she moved there to see what all the fuss was about (and to try and learn to speak Mandarin). Sarah remained in mainland China from 2007 to 2012, and her work experience includes two years as a project manager at Australian consulting firm, the Beijing Consulting Group, and two years at Touchmedia, a venture capital backed Chinese technology company. At Touchmedia, Sarah was the founding member of the company’s international team, and managed the establishment of the company’s first two markets outside of mainland China, Canada and Hong Kong. In 2008, Sarah founded the Shanghai branch of the Australia China Alumni Association, growing Shanghai membership from 60 to 1500 in two years and in 2009, was part of the small team that launched the now annual Australia China Alumni Awards. In 2010 she co-founded the Shanghai branch of the Australia China Young Professionals Initiative, and was also selected to serve as an honorary ambassador for Business Events Sydney. In 2012, Sarah relocated to Boston after being accepted to Harvard Business School, and will graduate in May 2014. At Harvard, Sarah has taken leadership roles in both the Techmedia and Entrepreneurship clubs, and completed a summer internship with Japanese internet conglomerate, Rakuten. Sarah also holds a BComm (Liberal Studies) from the University of Sydney. Born in Guizhou, China then migrating to Canberra, Australia, Lisa speaks fluent Mandarin and has a long-standing interest in and commitment to Sino-Australian affairs stemming from her desire to understand and reconcile her cultural roots. Lisa completed the Teach For Australia in 2012, a highly selective program whose participants teach in educationally disadvantaged schools for two years. She taught year 10-12 students at a regional Victorian secondary school and helped introduce an annual Diversity Day for multiculturalism in a predominantly Caucasian environment. Lisa also tutored remanded youth at the Melbourne Youth Justice Centre and taught disadvantaged rural primary and urban secondary students in Guizhou, China. Before moving into education, Lisa worked for several years as a corporate lawyer in Hong Kong and Sydney with King&Wood Mallesons, an international firm anchored in Asia. She managed the Business Mandarin training and was involved with other China law initiatives. Lisa received her undergraduate degrees in Commerce and Law from the Australian National University, with a semester abroad at the University of Hong Kong. She also holds a Masters of Teaching from the University of Melbourne. Veronica is an Advisor in the Australia in the Asian Century Implementation Taskforce at the Department of the Prime Minister and Cabinet. The cross-agency Taskforce was established to support implementation of the Australian Government’s Australia in the Asian Century White Paper. While working in the Taskforce, Veronica has demonstrated her passion for issues relating to Australia’s engagement with Asia, and her particular interest in the Australia-China relationship. Veronica was seconded to the Taskforce from the Department of Education, Employment and Workplace Relations. In 2010-11, Veronica spent a year working in Beijing for the Australia China Alumni Association as an Australian Youth Ambassador for Development. In this role, Veronica worked with local staff to build the profile of Australian-educated alumni in China through social and business networking events. Veronica graduated from the Australian National University in 2006 with a Bachelor of Arts and Asian Studies (Chinese). As part of her Asian Studies degree, Veronica spent a year studying Mandarin Chinese at the Beijing Language and Culture University. Veronica first started studying Chinese at high school after becoming inspired during a family visit to Jiangsu in 1995. Veronica is currently completing a Masters of Social Research through the Australian Demographic and Social Research Institute at the Australian National University. Sue-Lin Wong is a sixth year Asian Studies/Laws student at the Australian National University. She was a recipient of the Prime Minister’s Australia Asia Award 2011-2013. As part of the scholarship, Sue-Lin studied at the Tsinghua-Berkeley Inter-University Program for Chinese language and interned at the Natural Resources Defense Council and the New York Times Beijing Bureau. During her eight months interning at the New York Times in Beijing, Sue-Lin wrote both English and Chinese language articles and contributed research to pieces that covered topics ranging from urbanization, crackdowns on big dogs in Beijing to the experience of being an overseas Chinese in China. As an Australian born Chinese, Sue-Lin is particularly interested in how young Australians and Chinese can meaningfully engage with each other. She is fascinated why so many foreigners in China rarely have any deep, real friendships with Chinese. During her time in China, Sue-Lin has gone root-seeking for her ancestral villages in Guangdong and Fujian provinces, worked at the Beijing Olympics, survived a semester on exchange at a Beijing high school, taught English amongst the rice paddies on rural Hunan, studied in the hallowed halls of Peking University, partied for a semester at Beijing Language and Culture University and ridden lots of trains around China – one of her favourite things of all time. Dr Lennon Chang joined the Department of Applied Social Studies at the City University of Hong Kong as a tenure-track Assistant Professor in November 2011. He is also an Associate Investigator at the Australian Research Council Centre of Excellence in Policing and Security. He was awarded his PhD by the Australian National University in November 2010. He has a Masters in Criminology and Bachelor in Law from National Taipei University. In 2007 he received an Endeavour Asia Award and in 2009 was selected by Peking University and Griffith Asia Institute to be an Australia-China Emerging Leader. In 2013, Lennon was a Global Emerging Voices Fellow. From 2005 to 2007, Lennon worked as a researcher and project manager at the Science and Technology Law Centre, Institute for Information Industry, which is recognized as one of the most important think-tanks in Taiwan in the area of legal responses to new technology. Before joining City University of Hong Kong, Lennon worked as a post-doctoral research officer at the Centre of Excellence in Policing and Security at the Australian National University. Dr Chang is interested in researching crime and governance of cyberspace — cybercrime, cyber terrorism and cyber warfare. He is particularly interested in the regulation and governance of cyberspace in the Asia-Pacific region. His book Cybercrime in the Greater China Region: Regulatory Responses and Crime Prevention (Edward Elgar, 2012) is about the nature and range of responses to cybercrime between China and Taiwan. Dr Chang’s professional interest in China continues and he is currently researching on-line vigilantism in China. He is also undertaking NGO-sponsored research into cybercrime and cyber-deviance among Hong Kong juveniles. Jason is a Manager in Risk and Controls Assurance practice of PricewaterhouseCoopers Hong Kong. He is managing the technology risk and strategy, information security, regulatory compliance and incident investigation businesses in Hong Kong and Southern China, including advising numerous financial institutions, governments, regulatory bodies, quasi-government organisations, and major Chinese state-owned enterprises. Jason also serves as a committee member of the Professional Development Section of ISACA that delivers continuing professional development seminars, professional information security examinations, CISA and CISM revision classes in Hong Kong and Southern China. Jason has been a guest lecturer at the University of Hong Kong to deliver technology general education classes and in Hong Kong University of Science and Technology (HKUST) to deliver penetration testing workshops. Jason also serves as a member of Youth Service Advisory Committee of The Hong Kong Federation of Youth Groups (HKFYG) and a Director, Treasurer and Council Member of his alma mater’s alumni organisation, St. Louis School. Jason holds a Bachelor of Engineering in Information Engineering (1st class honours) with minor in Business Administration from The Chinese University of Hong Kong (CUHK) and Master of Laws (LLM) in Arbitration & Dispute Resolution at HKU. Jill Xiaozhou Ju is co-chair of Harvard Business School China Entrepreneurship Club and co-founder of Sensible Baby, a Boston based infant safety technology start-up. She is an active member of the Boston tech start-up and social enterprises scene. Previously, Jill worked for UBS Investment Banking in Hong Kong and Beijing, focusing on China cross-border M&A transactions. She also worked for Fab.com in Berlin and Shanghai Development Research Center in Shanghai. Jill graduated from Peking University with a Bachelor of Economics. She is currently studying at Harvard Business School as an MBA candidate. She speaks fluent Mandarin, English and German. With years of studying and working in multicultural environment since a young age, she has a good understanding of both Chinese and western culture and am passionate about bridging those two in both cultural and business context. Yijia LI holds a double Bachelor degree in Biology from Tsinghua University and in Economics from Peking University. He has done internships in Mercer consulting, Roland Berger Consultant and Tsinghua Science Park. He is now a third year Ph.D. student in Neuroscience at the Florey Institute of Neuroscience and Mental Health, University of Melbourne. Besides study, he and other three Chinese overseas students founded a Not-For-Profit Organization called Melbourne Pioneer (MP). MP is strongly supported by the Group of Eight and local community’s network resources, MP is determined to dedicate itself to promoting and providing innovative entrepreneurship services for the young and ambitious generation in Australia. At MP, we uphold the belief of “growth, and help others grow; achievements, and help others achieve!” It is embraced and reinforced by the enterprise culture “Vision, Passion, Action”. As we are always passionate about innovation and entrepreneurship, this leads to us building better services for businesses and the greater social welfare so that everyone benefits. MP has demonstrated a rising trajectory in attracting and training more and more talented youth. As Melbourne’s first and proudly the only Chinese innovation and entrepreneurship platform, we have been constantly working to help more Chinese overseas students to realize their personal values and achieve the best in Australia. In 2013, MP is promoting Chinese students to do volunteering work in local communities to help them be involved in Australian culture. Liu Sisi is a student at Nanyang Technological University (NTU), Singapore. She received her Bachelor’s Degree with honours in Accounting from Dongbei University of Finance and Economics (DUFE). Liu Sisi represented DUFE in the Dalian City Model United Nations Conference organized by the Dalian Municipal Communist Youth League Committee. investigating the issues of an aging society, where she played the part of a Cuban diplomat. She has also volunteered at the Dalian Summer Davos, World Economic Forum. She represented her alma mater in the CFA Global Investment Research Challenge broadcast on China Central Television (CCTV) and won “The Best Performing Team” award in December 2010. She also led a 4-member team in the Chartered Institute of Management Accountants (CIMA) Global Business Challenge, making it into the TOP 20 in Northern China in 2010-11. Liu Sisi began learning Guzheng, a traditional Chinese musical instrument at an early age. She is also accomplished in Chinese calligraphy and a number of her works have been collected and exhibited in the local art gallery. She dreams of one day promoting Chinese traditional culture internationally. She believes that cultural diplomacy will bring the people of China and Australia closer together. Mr. Liu Tao (Wellington) is currently a graduate student of Master in Public Policy at Lee Kuan Yew School of Public Policy, National University of Singapore. His specialisation in his Masters program is in economic policy analysis focusing on Asia. Prior to studying in Singapore, he had 10 years work experience with China Customs and Shanghai Municipal Government. In Singapore, he also worked with the team of Worldtrade Management Services at PricewaterhouseCoopers to provide trade compliance advisory. At present, he is conducting a summer internship with United Nations Economic and Social Commission for Asia and the Pacific in Bangkok, Thailand. Liu started his career in 2002 with Shanghai Customs as a Customs official. During his tenure of 7 years, he was fortunate to have substantial practical and research experiences in the trade facilitation area and to be engaged in some national Customs reform projects, e.g. e-Customs and e-Port. He was closely connected with the foreign trade community and has witnessed firsthand the difficulties of pushing through system-wide changes in China’s trade institution. Some of his professional thoughts and achievements contributed to the published working papers and won him awards from Customs. From 2009 to 2012, Liu worked for the Foreign Affairs Office of Shanghai Government as a desk officer for Asia in the consular affairs division. His duties included liaison with diplomats of Consular Corps in Shanghai and international cooperation between Shanghai and foreign governments. He also took responsibility for resolving the conflicts and disputes of foreign expats and handled the consular protection requested from the consulates. His duty facilitated him to be in frequent contacts with the Australian Consulate General in Shanghai and other senior delegates from Australia. In his current internship with the UN in Bangkok, there are many exciting highlights in the multi-national civilization exchange. He joined the Trade and Investment Division to work with the trade facilitation unit, contributing to the national single window policy guideline for Asia and the Pacific region. Based on his previous and current professional roles in trade, diplomacy and business, Liu will bring to ACYD 2013 his insightful perspective on not only the China-Australia ties, but the challenges and opportunities of an emerging Asia to the globe. Liu was born and grew up in Shanghai, China. He holds a Bachelor degree of Engineering and a Master of Public Administration from Tongji University and has short-term study experience in Austria receiving a Diploma in European Studies from the University of Vienna. He has been awarded the prestigious Oei Hong Leong Scholarship to study economic policy in Singapore from 2012 to 2014. Yun Liu is an incoming student of Johns Hopkins Paul H. Nitze School of Advanced International Studies (SAIS), which is based in Washington, D.C. Yun’s strong interest in international affairs and unique international experiences have been demonstrated through her diverse working experiences in both Australia and China. She previously interned at the Lowy Institute for International Policy, where she assisted in conducting research and preparing international workshops for the East Asian Program. She also worked in the Office of Vice-Chancellor at the University of Sydney as a project assistant, and successfully coordinated and implemented over 15 high-level leadership training programs from Asia-Pacific. Yun has also interned at China Radio International, the most prominent international radio company in China. The internship provided her the opportunity to look at international affairs from a media angle. Yun graduated from the University of Sydney in April 2013 with First Class Honours in her Bachelor of International and Global Studies, majoring in Government and International Relations, and Economics. During her Honours year, she completed a 19,000-word thesis on Taiwan’s changing economic policymaking towards China Mainland. Her outstanding academic record has brought her many awards, including the 2009 International Merit Scholarship and the 2010 Academic Merit Prize. As a Chinese student in Australia, Yun has devoted herself to promoting cross-cultural exchange in her capacity as the International Student Intern at the University of Sydney Union. In 2012, she was awarded a University of Sydney Union Blue Award for her outstanding contribution to the student community. She is also a finalist of the University of Sydney Graduate Medal. Yun hopes to work in an international organisation in the future, where she can continue to promote mutual understanding and consensus building for China and the rest of the world. Chloe is an investment banker-turned-entrepreneur who was born in Shanghai and now lives in Hong Kong with her husband. Chloe moved to Australia at the age of 16 to study and graduated from the University of Sydney with a Bachelor of Commerce (Liberal Studies) degree. She has a Master of Finance (Investment Banking) degree from INSEAD Business School which was sponsored by her first employer, Macquarie Capital. At Macquarie, Chloe worked for five years in the Real Estate Corporate Advisory team in Sydney, Melbourne, Hong Kong and Shanghai. In the summer of 2011, she met her current business partners and established Findings Group Limited, an advanced distribution and business development company in Hong Kong. Having spent half of her life in China and Australia respectively, Chloe has a deep understanding and appreciation for both cultures, their similarities and more so their differences. With the increasing number of Chinese immigrants as well as the growing economic ties between the two nations, Chloe firmly believes that China and Australia will both benefit by making an effort to learn from and better understand each other, such as the deep rooted respect towards the elderly in Chinese societies and the value of ‘a fair go’ in Australian culture. As a part of her work, she helps western companies who are interested in entering China bridge this cultural gap and form localised business strategies. Chloe is a quantum physics enthusiast with further interests in yoga and meditation. REN Jie, though a junior student from Beijing University of Aeronautics and Astronautics, is now a youth ambassador of Corporate Social Responsibility honoured by the UN Global Compact Network, and President of China Alliance of Campus International Societies. He devotes time to promoting more enterprises to value Corporate Social Responsibility including environment protection, human rights and technology innovation. Under his leadership, China Alliance of Campus International Societies achieved the connection to Embassies and other international organizations. At the end of July, he attended the China Summit on Caring for Climate and organized youth from different countries to draft a proposal of prevent climate change. During the Summit, he interviewed high-end entrepreneurs and attracted the attention of media. He has also achieved in his major field. At the Asian Science Camp held in Japan, which is only open to top technology students in Asia, Ren Jie gained a lot from communication with Asian Nobel Prize owners in cutting-edge areas of Mathematics, Physics and Chemistry. A summer intern in Citibank also aroused his interest in financial and investigation, which inspires him to go further. As an Australian Postgraduate Award Scholar, Ying Shen is now a PhD candidate in Environmental Law at the University of Western Sydney. She received her LL.B (Ranking No. 1) from Nanjing University, China and two LL.M degrees from Nanjing University, China and the University of Goettingen, Germany. During her undergraduate and postgraduate study, Ying volunteered and interned with various institutions in China and Germany. Upon completion of her LL.M study, she worked as an Assistant Judge at Jiangsu Wuxi People’s Intermediate Court in China from 2010 to 2011. To pursue her academic interest, she resigned her post as Assistant Judge and took up her PhD candidature in Australia in 2011. Ying’s current research focuses on the development of the legal framework for the control of carbon emissions in China. She conducts her research work from a comparative perspective. She has written on different mitigation mechanisms such as carbon tax and ETS, and her articles have been published or accepted for publication by some leading American environmental law journals. Ying was a frequent scholarship recipient. She secured scholarships in each academic year during her undergraduate study and was funded by DAAD (German Academic Exchange Service) during her time in Germany. With studying and living experience in several countries, she is keen to cross-cultural conversations with people from different background. Lulu (Yun Ting) Shen was born in Beijing, China and came to Australia pursuing a higher education at Monash University. Currently working as the Chinese media specialist for the City of Sydney, Lulu has intimate knowledge in engaging a significant variety of cultural communication projects, many of which involves Australia and China bilateral relations. The experience provides Lulu with inside knowledge about journalism practices in both Australia and China. Lulu assisted in successful publicity campaigns for the City of Sydney’s Chinse New Year Festival (CNY) and New Year’s Eve celebration, resulting in the highest level of national and international ethnic media coverage ever recorded. She supported the City in maintaining the CNY as the largest CNY celebration outside of mainland China, resulting in the event being one of the City’s most successful CNY celebrations to date. Lina Tao is a postgraduate research student at the School of Humanities, University of New South Wales, Australia. She completed her Bachelor’s degree in Communication Studies at Peking University in 2004. After graduating, she worked as a journalist and news editor at a Chinese daily newspaper, the Beijing Times (Jinghua Shibao). From 2008-12, she worked as a researcher and policy analyst at China Policy, a Beijing-based policy consultancy. She managed research projects on a wide range of social and policy issues with a particular focus on the power of Chinese social media and developed protocols and content for China Policy’s information system products. Lina received an ‘Excellent Students Award’ and ‘University Principal’s Fund Research Award’ as an undergraduate at Peking University. In 2013, she was awarded the University International Postgraduate Award by UNSW. Her research project examines the intersections between the media, migration, and children in contemporary China. As an individual who had moved from rural to urban China and has now experienced a transnational movement to Australia, she is always fascinated by migrants’ journeys and the media’s role in the populous mobility. Her research interests lie in migration, practice of journalism, media policies, and social media. Neroli Wang recently graduated from Peking University with a Juris Master Degree, with which she majored in anti-monopoly and anti-unfair competition law. Currently, she sets her feet in three different fields, including in the field of law as a part-time lawyer, business as the CBO&CLO of McJayden (Beijing) Biotech Co., Ltd., and in culture as a fixed guest of CCTV 1. Neroli previously worked as a Legal Intern at the Freshfields Bruckhaus Deringer LLP, advising on Chinese competition law and merger control, such as General Cable on its acquisition of Alcan Cable business from Rio Tinto. Neroli was also an intern at the Ministry of Commerce’s Anti-Monopoly Bureau of P.R.C.in 2011. At the beginning of 2012, she was awarded a scholarship to the China Young Development Program held at Columbia University in the United States. Neroli is very civic minded and has always taken a very keen interest in roles where she can promote community development. In 2010, she volunteered at the Yilian Labor Legal Aid and Research Center of Beijing as a consultant. She investigated mining areas, researching the professional and living conditions of mine-workers and provided legislative proposals for prevention and control of occupational diseases. Neroli is well-practiced in the piano, the violin and the African drums with a bunch of prizes. Her poetry recital skills earned her a national prize and, to this day, Neroli is still active on the stage as a visiting host for the Evening Dialogue program of CCTV-1, which is the primary channel on China’s state television network, spreading the voice of young people through dialogue with celebrities. Under the cultural going-out strategy of Chinese government, Neroli organises a translation team, made up of students from Cambridge University, Australian National University and Peking University, to translate thirteen outstanding Chinese reporting literatures into English. These books will go to overseas markets as the earliest translated Chinese literature this year. In the future, Neroli wishes to help the publishing house to import valuable Australian literature into China, with the aim of creating more chances for Sino-Australia exchange and communication. 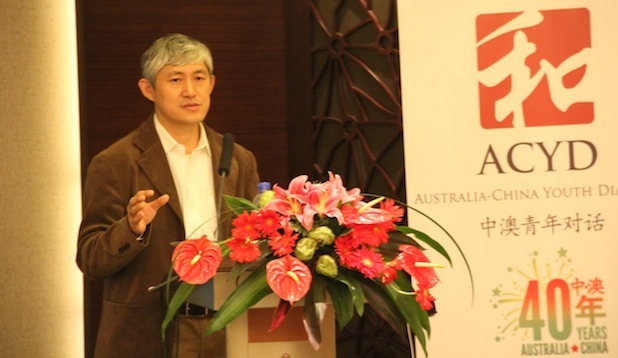 ZHANG Lei joined the Australian Studies Centre at Renmin University of China where he has organised a series of events promoting Australia. He has lead activities ranging from the RUC Australian Cultural Week, to Australia-oriented academic lectures, to managing the Centre’s blog focusing on current affairs in Australia. As a MA candidate in Australian Studies program, his research interests include relation between Australia and the Asia-Pacific, Sino-Australia relationship and Australian Postmodern Literature. His current interests include re-positioning Australia in the Asia-Pacific in the new century, the implications of America’s rebalancing toward Asia in Australia, transnational Australian studies and transpacific studies. Zhang Lei has attended forums and conferences in South Korea, America and Europe. He finds it a great pleasure to meet new friends and share cutting-edge ideas. Zhang Lei graduated with a BA in English from China Agricultural University with the Best Graduate Thesis Award and the Graduate Honour in 2011. During his undergraduate years, he served as the chair of the student union in the department for two terms and co-founded the International Communication and Cooperation Association at CAU. Joe Zhao has been working for Australia and New Zealand Bank (ANZ) since September 2009. He is currently the Director as Head of Large Local Corporate in ANZ Shanghai Branch. Previously, Joe also worked in Corporate Banking for Royal Bank of Scotland for almost 4 years and Standard Chartered Bank for 2 years. The work scope includes large Chinese corporate-orientated marketing, communication and selling commercial bank’s products. In Joe’s client portfolio, a number of clients also have subsidiaries set up and operating in Australia, covering industry across iron & steel, agriculture, shipping, container transportation, renewable energy, automakers, etc. With strong economic ties and collaboration between Australia and China, Joe has assisted more and more Chinese companies explore business opportunities in the Australian market. Joe Zhao studied in the UK and holds a Master degree in Economics and Finance from University of Warwick, and an undergraduate degree from University of Buckingham. Outside of work, he enjoys swimming and playing golf. Once again, we would like to thank everyone who applied for the ACYD. This year’s applicants were of an extremely high calibre and we strongly encourage those who were unsuccessful to apply again in 2014 when the ACYD returns to China. We also encourage you to get involved with other ACYA group initiatives: the Australia-China Youth Association; Australia-China Young Professionals Initiative; and the Engaging China Project. Please note that the Australia-China Youth Dialogue is staffed 100% by volunteers, so we are unable to provide specific feedback if your application is unsuccessful. Please Note: This schedule is still to be confirmed.